Your Dentist in Wall Township Delivers Perfect Smiles with Veneers! The act of smiling is one of the simplest functions to perform. It doesn’t require much effort at all. In fact, it’s harder to frown, but when your teeth aren’t aesthetically appealing, you choose the latter. Why? You feel ashamed at the way your teeth look, so you’d rather hide them than risk the ridicule of others. Thankfully, your dentist in Wall Township has a cosmetic solution for improving your front teeth. He recommends porcelain veneers to deliver smile perfection! Continue reading to learn how. Porcelain veneers are thin ceramic shells that are custom-crafted to alter the look of the teeth that are visible when you smile. They are used to mask slight gaps, crooked, misaligned or stained ivories. At the first visit, your dentist will remove a small portion of your enamel and apply an acetate solution to rough the surface. This will allow for temporary veneers to be attached. He will then take impressions of your teeth and send them off to a trusted lab so that your permanent veneers can be fabricated. When your final applications are ready, you’ll return to your dentist to have them placed. In just two visits, you’ll have a brand-new smile! What are the Other Advantages of Veneers? A Time-Saving Process – Whereas other procedures, like wearing braces, may take years to correct your smile, the porcelain veneer process is almost instant. The moment they are applied, your smile is perfected. Minimally Invasive – The most invasive part of the process is the removal of a thin layer of enamel. There is nothing else done to your teeth beyond that. Boost in Confidence – Your smile is being judged all the time, so it’s great to know that you’ll be making a positive impression when you flash your pearly whites. 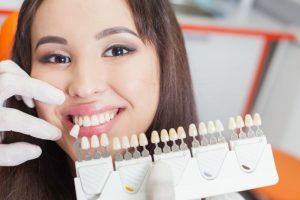 An Answer to Troublesome Stains – If you’ve had some stubborn stains or discoloration that can’t be addressed by brushing or whitening methods, veneers offer a sure solution. Oral Hygiene – You should continue practicing excellent oral hygiene, which includes brushing and flossing your teeth. Your veneers won’t be susceptible to decay, but the teeth under them still are, so they need to be cared for. Your Teeth aren’t Tools – Using your teeth to open bottle caps or packages can spell disaster for your veneers, causing them to chip or dislodge. Avoid Certain Foods and Drinks – There are certain edibles and beverages that are known to stain your teeth like tomato sauce, dark berries, tea and coffee. Although your veneers are relatively stain-resistant, your other teeth are still vulnerable. If they’re stained, it will create a glaring difference between them and the veneers. A final important activity to remember is to visit your dentist semi-annually for cleanings and checkups. Not only will these appointments allow him to monitor the condition of your veneers, but also address your oral health in a proactive manner. To schedule a consultation, reach out to your dentist today! Dr. Edward J. Dooley earned his DMD degree from the University of Pennsylvania’s School of Dental Medicine. To expand his knowledge, he has logged over 1500 hours of continuing education and is certified in the DURAthin laminate veneers process. Dr. Dooley can be reached for more information through his website. Comments Off on Your Dentist in Wall Township Delivers Perfect Smiles with Veneers!